The Aral Sea (/ˈærəl/) was an endorheic lake (one with no outflow) lying between Kazakhstan (Aktobe and Kyzylorda Regions) in the north and Uzbekistan (Karakalpakstan autonomous region) in the south. 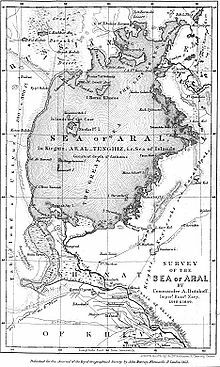 The name roughly translates as "Sea of Islands", referring to over 1,100 islands that had dotted its waters; in the Turkic languages aral means "island, archipelago". The Aral Sea drainage basin encompasses Uzbekistan and parts of Tajikistan, Turkmenistan, Kyrgyzstan, Kazakhstan, Afghanistan and Iran. Formerly the fourth largest lake in the world with an area of 68,000 km2 (26,300 sq mi), the Aral Sea has been shrinking since the 1960s after the rivers that fed it were diverted by Soviet irrigation projects. 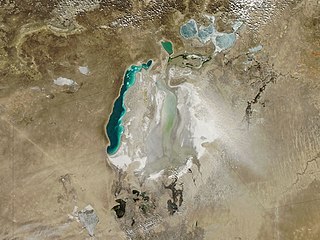 By 1997, it had declined to 10% of its original size, splitting into four lakes: the North Aral Sea, the eastern and western basins of the once far larger South Aral Sea, and one smaller intermediate lake. By 2009, the southeastern lake had disappeared and the southwestern lake had retreated to a thin strip at the western edge of the former southern sea; in subsequent years, occasional water flows have led to the southeastern lake sometimes being replenished to a small degree. Satellite images taken by NASA in August 2014 revealed that for the first time in modern history the eastern basin of the Aral Sea had completely dried up. The eastern basin is now called the Aralkum Desert. In an ongoing effort in Kazakhstan to save and replenish the North Aral Sea, the Dike Kokaral dam project was completed in 2005; in 2008, the water level in this lake had risen by 12 m (39 ft) compared to 2003. Salinity has dropped, and fish are again found in sufficient numbers for some fishing to be viable. The maximum depth of the North Aral Sea is 42 m (138 ft) (as of 2008[update]). The shrinking of the Aral Sea has been called "one of the planet's worst environmental disasters". The region's once-prosperous fishing industry has been decimated, bringing unemployment and economic hardship. 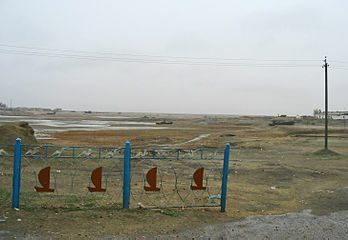 The water from the diverted Syr Darya river is used to irrigate about two million hectares (5,000,000 acres) of farmland in the Ferghana Valley. The Aral Sea region is also heavily polluted, with consequential serious public health problems. Geographer Nick Middleton believes that the Amu Darya did not flow into the shallow depression that now forms the Aral Sea until the beginning of the Holocene, and it is known that the Amu Darya flowed into the Caspian Sea via the Uzboy channel until the Holocene. The Syr Darya formed a large lake in the Kyzyl Kum during the Pliocene known as the Mynbulak depression. Most of the area around the Aral Sea was inhabited by desert nomads who left few written records. However, the Oxus delta to the south has a long history under the name of Khwarezm. It was once the westernmost border of Tang dynasty China. Russian naval presence on the Aral Sea started in 1847, with the founding of Raimsk, which was soon renamed Fort Aralsk, near the mouth of the Syr Darya. Soon, the Imperial Russian Navy started deploying its vessels on the sea. Owing to the Aral Sea basin not being connected to other bodies of water, the vessels had to be disassembled in Orenburg on the Ural River, shipped overland to Aralsk (presumably by a camel caravan), and then reassembled. 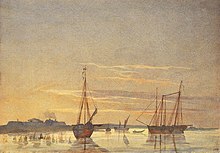 The first two ships, assembled in 1847, were the two-masted schooners named Nikolai and Mikhail. The former was a warship; the latter was a merchant vessel meant to serve the establishment of the fisheries on the great lake. In 1848, these two vessels surveyed the northern part of the sea. In the same year, a larger warship, the Constantine, was assembled. Commanded by Lt. Alexey Butakov (Алексей Бутаков), the Constantine completed the survey of the entire Aral Sea over the next two years. The exiled Ukrainian poet and painter Taras Shevchenko participated in the expedition, and painted a number of sketches of the Aral Sea coast. This was part of the Soviet plan for cotton, or "white gold", to become a major export. This temporarily succeeded, and in 1988, Uzbekistan was the world's largest exporter of cotton. 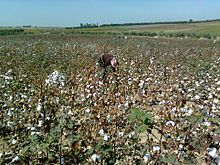 Cotton production in Uzbekistan is still important to the national economy of the country. Cotton is Uzbekistan's main cash crop, accounting for 17% of its exports in 2006. The construction of irrigation canals began on a large scale in the 1940s. [clarification needed] Many of the canals were poorly built, allowing water to leak or evaporate. From the Qaraqum Canal, the largest in Central Asia, perhaps 30 to 75% of the water went to waste. Today,[when?] only 12% of Uzbekistan's irrigation canal length is waterproofed. Of the 47,750 km of interfarm irrigation channels in the basin, only 28% have anti-infiltration linings. Only 77% of farm intakes have flow gauges, and of the 268,500 km of onfarm channels, only 21% have anti-infiltration linings, which retain on average 15% more water than unlined channels. By 1960, between 20 and 60 km3 (4.8 and 14.4 cu mi) of water each year was going to the land instead of the sea. Most of the sea's water supply had been diverted, and in the 1960s, the Aral Sea began to shrink. From 1961 to 1970, the Aral's level fell at an average of 20 cm (7.9 in) a year; in the 1970s, the average rate nearly tripled to 50–60 cm (20–24 in) per year, and by the 1980s, it continued to drop, now with a mean of 80–90 cm (31–35 in) each year. The rate of water use for irrigation continued to increase; the amount of water taken from the rivers doubled between 1960 and 2000, and cotton production nearly doubled in the same period. In the first half of the 20th century prior to the irrigation, the sea’s water level above sea level held steady at 53 m; this has changed drastically by 2010, when the large Aral was 27 m and the small Aral 43 m above sea level. 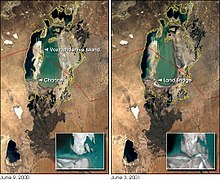 In 1987, the continuing shrinkage split the lake into two separate bodies of water, the North Aral Sea (the Lesser Sea, or Small Aral Sea) and the South Aral Sea (the Greater Sea, or Large Aral Sea). In June 1991, Uzbekistan gained independence from the Soviet Union. Craig Murray, a UK ambassador to Uzbekistan in 2002, described the independence as a way for Islam Karimov to consolidate his power rather than a move away from a Soviet-style economy and its philosophy of exploitation of the land. Murray attributes the shrinkage of the Aral Sea in the 1990s to Karimov's cotton policy. The government maintained an enormous irrigation system which Murray described as massively wasteful, with most of the water being lost through evaporation before reaching the cotton. [clarification needed] Crop rotation was not used, and the depleted soil and monoculture required massive quantities of pesticides and fertilizer. The runoff from the fields washed these chemicals into the shrinking sea, creating severe pollution and health problems. 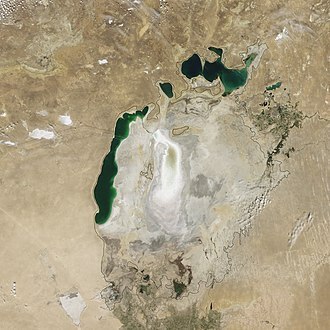 As the water supply of the Aral Sea decreased, the demand for cotton increased and the government reacted by pouring more pesticides and fertilizer onto the land. Murray compared the system to the slavery system in the pre-Civil War United States; forced labor was used, and profits were siphoned off by the powerful and well-connected. In 2004, the Aral Sea's surface area was only 17,160 km2 (6,630 sq mi), 25% of its original size, and a nearly five-fold increase in salinity had killed most of its natural flora and fauna. By 2007, the sea's area had further shrunk to 10% of its original size. The decline of the North Aral has now been partially reversed following construction of a dam (see below), but the remnants of the South Aral continue to disappear and its drastic shrinkage has created the Aralkum, a desert on the former lake bed. The Aral Sea is considered an example of ecosystem collapse. The ecosystems of the Aral Sea and the river deltas feeding into it have been nearly destroyed, not least because of the much higher salinity. The receding sea has left huge plains covered with salt and toxic chemicals resulting from weapons testing, industrial projects, and pesticides and fertilizer runoff. Due to the shrinking water source and subsequent worsening water and soil quality, pesticides were increasingly used starting in the 1960s to increase cotton yields, which further polluted the water with toxins such as DDTs. Furthermore, “PCB-compounds and heavy metals” from industrial pollution contaminated both water and soil. Due to the minimal amount of water left in the Aral sea, concentrations of these pollutants have increased drastically in both the water and soil. These substances form wind-borne toxic dust that spreads throughout the region. People living near the Aral Sea come in contact with pollutants through drinking water and inhalation of contaminated dust. Furthermore, due to the presence in drinking water, the toxins have entered the food chain. As a result, the land around the Aral Sea is heavily polluted, and the people living in the area are suffering from a lack of fresh water and health problems, including high rates of certain forms of cancer and lung diseases. Respiratory illnesses, including tuberculosis (most of which is drug resistant) and cancer, digestive disorders, anaemia, and infectious diseases are common ailments in the region. Liver, kidney, and eye problems can also be attributed to the toxic dust storms. All of this has resulted in an unusually high fatality rate among vulnerable parts of the population: the child mortality rate is 75 in every 1,000 newborns, and maternity death is 12 in every 1,000 women. The dust storms also contribute to water shortages through salt deposition. The overuse of pesticides on crops to preserve yields has made this worse, with pesticide use far beyond health limits. Crops in the region are destroyed by salt being deposited onto the land, and fields are being flushed with water at least four times per day to try to remove the salinity from the soils. The land is decaying, causing few crops to grow besides fodder, which is what the farmers in Kazakhstan are now deciding to seed. 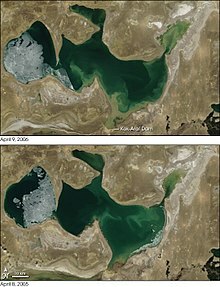 (230) Large bodies of water, like the Aral Sea, can moderate a region’s climate by altering moisture and energy balance. Loss of water in Aral Sea has changed surface temperatures and wind patterns. This has resulted in hotter summers and cooler winters (an estimated 2˚C-6˚C change in either direction) and the emergence of dust storms over the area. 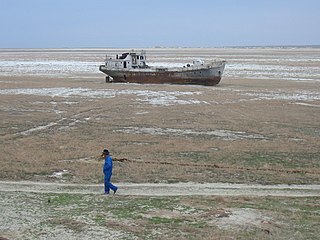 The Aral Sea fishing industry, which in its heyday employed some 40,000 and reportedly produced one-sixth of the Soviet Union's entire fish catch, has been devastated. In the 1980’s commercial harvests were becoming unsustainable, and by 1987 commercial harvest became nonexistent. Due to the declining sea levels, salinity levels became too high for the 20 native fish species to survive. The only fish that could survive the high-salinity levels was flounder. Due to the declining sea levels, former fishing towns along the original shores have become ship graveyards. Aral, originally the main fishing port, is now several miles from the sea and has seen its population decline dramatically since the beginning of the crisis. The town of Moynaq in Uzbekistan had a thriving harbour and fishing industry that employed about 30,000 people; now it lies miles from the shore. Fishing boats lie scattered on the dry land that was once covered by water; many have been there for 20 years. Women and children are the most vulnerable populations in this environmental health crisis due to the highly polluted and salinated water used for drinking and the dried seabed. Toxins from pesticides have been found in blood and breast milk of mothers, specifically organochlorides, polychlorinated biphenyl compounds (PCBs), DDT compounds, and TCDD. These toxins can be, and often are, passed on to the children of these mothers resulting in low birthweight children and children with abnormalities. The rate of infants being born with abnormalities is five times higher in this region than in European countries. The Aral Sea region has 26% of its children born at low birthweight, which is two standard deviations away from a national study population gathered by the WHO. Exposures to toxic chemicals from the dry seabed and polluted water have caused other health issues in women in children. Renal tubular dysfunction has become a large health concern in children in the Aral Sea region as it is showing extremely high prevalence rates. Renal tubular dysfunction can also be related to growth and developmental stunting. This, in conjunction with the already high rate of low birth weight children and children born with abnormalities, poses severe negative health effects and outcomes on children. These issues are compounded by the lack of research of maternal and child health effects caused by the demise of the Aral Sea. For example, only 26 peer-reviewed articles and four reports on children’s health were produced between 1994 and 2008. In addition, there is a lack of health infrastructure and resources in the Aral Sea region to combat the health issues that have arose. There is a lack of medication and equipment in many medical facilities, so health professionals do not have access to the necessary supplies to do their jobs in the Kazakhstan and Uzbekistan regions. There is also meager development of a health information system that would allow for extensive research or surveillance of emerging health issues due to Aral sea issues. An absence of a primary care approach in the health systems of this region also hinders services and access the could prevent and treat issues stemming from the Aral Sea crisis, especially in women and children. The impoverished are also particularly vulnerable to the environmental and health related effects of changes to the Aral Sea. These populations were most likely to reside downstream from the Basin and in former coastal communities. They were also among the first to be detrimentally affected, representing at least 4.4 million people in the region. Considered to have the worst health in this region, their plight was not helped when their fishery livelihoods vanished with the decreasing levels of water and loss of many aquatic species. Thus, those in poverty are entrenched in a vicious cycle. Cotton picking in Uzbekistan. Cotton is one of the biggest water consuming plants. Phase Two of the Aral Sea Basin programme followed in 1998 and ran for five years. The main shortcomings of phase two were due to its lack of integration with the local communities involved. The scheme was drawn up by the World Bank, government representatives, and various technical experts, without consulting those who would be affected. An example of this was the public awareness initiatives, which were seen as propagandist attempts by people with little care or understanding of their situation. These failures have led to the introduction of a new plan, funded by a number of institutions, including the five countries involved and the World Bank. In 1997, a new plan was conceived which would continue with the previous restoration efforts of the Aral Sea. The main aims of this phase are to improve the irrigation systems currently in place, whilst targeting water management at a local level. The largest project in this phase is the North Aral Sea Project, a direct effort to recover the northern region of the Aral Sea. 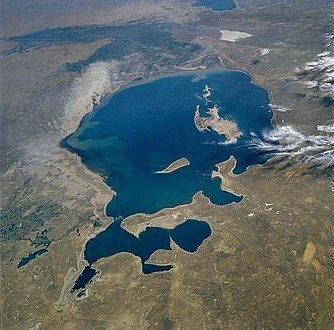 The North Aral Sea Project's main initiative is the construction of a dam across the Berg Strait, a deep channel which connects the North Aral Sea to the South Aral Sea. The Kok-Aral Dam is eight miles long and has capacity for over 29 cubic kilometres of water to be stored in the North Aral Sea, whilst allowing excess to overflow into the South Aral Sea. On October 6, 2002, the Heads of States met again to revise the ASBP program. ASBP-2 was in place from 2003-2010. The main purpose of the ASBP-2 was to set up projects that covered a vast amount of environmental, socioeconomic and water management issues. The ASBP-2 was financed by organization such as the UNDP, World Bank, USAID, Asian Development Bank, and the governments of Switzerland, Japan, Finland, Norway and others. Over 2 billion US Dollars was provided by the IFAS country members to the program. Work is being done to restore in part the North Aral Sea. Irrigation works on the Syr Darya have been repaired and improved to increase its water flow, and in October 2003, the Kazakh government announced a plan to build Dike Kokaral, a concrete dam separating the two halves of the Aral Sea. Work on this dam was completed in August 2005; since then, the water level of the North Aral has risen, and its salinity has decreased. As of 2006[update], some recovery of sea level has been recorded, sooner than expected. "The dam has caused the small Aral's sea level to rise swiftly to 38 m (125 ft), from a low of less than 30 m (98 ft), with 42 m (138 ft) considered the level of viability." 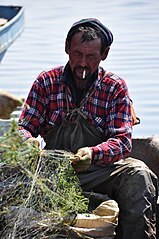 Economically significant stocks of fish have returned, and observers who had written off the North Aral Sea as an environmental disaster were surprised by unexpected reports that, in 2006, its returning waters were already partly reviving the fishing industry and producing catches for export as far as Ukraine. The improvements to the fishing industry were largely due to the drop in the average salinity of the sea from 30 grams to 8 grams per liter; this drop in salinity prompted the return of almost 24 freshwater species. The restoration also reportedly gave rise to long-absent rain clouds and possible microclimate changes, bringing tentative hope to an agricultural sector swallowed by a regional dustbowl, and some expansion of the shrunken sea. "The sea, which had receded almost 100 km (62 mi) south of the port-city of Aralsk, is now a mere 25 km (16 mi) away." The Kazakh Foreign Ministry stated that "The North Aral Sea's surface increased from 2,550 square kilometers (980 sq mi) in 2003 to 3,300 square kilometers (1,300 sq mi) in 2008. The sea's depth increased from 30 meters (98 ft) in 2003 to 42 meters (138 ft) in 2008." Now, a second dam is to be built based on a World Bank loan to Kazakhstan, with the start of construction initially slated for 2009 and postponed to 2011, to further expand the shrunken Northern Aral,[not in citation given] eventually reducing the distance to Aralsk to only 6 km (3.7 mi). Then, it was planned to build a canal spanning the last 6 km, to reconnect the withered former port of Aralsk to the sea. The South Aral Sea, half of which lies in Uzbekistan, was largely abandoned to its fate. Only excess water from the North Aral Sea is now periodically allowed to flow into the largely dried-up South Aral Sea through a sluice in the dyke. Discussions had been held on recreating a channel between the somewhat improved North and the desiccated South, along with uncertain wetland restoration plans throughout the region, but political will is lacking. Uzbekistan shows no interest in abandoning the Amu Darya river as an abundant source of cotton irrigation, and instead is moving toward oil exploration in the drying South Aral seabed. The International Fund for Saving the Aral Sea (IFAS) was developed on March 23, 1993, by the ICWC to raise funds for the projects under Aral Sea Basin programmes. The IFAS was meant to finance programmes to save the sea and improve on environmental issues associated with the basin's drying. This programme has had some success with joint summits of the countries involved and finding funding from the World Bank to implement projects; however, it faces many challenges, such as enforcement and slowing progress. Vozrozhdeniya (Rebirth) Island, is a former island of the Aral Sea or South Aral Sea. Due to the ongoing shrinkage of the Aral, it became first a peninsula in mid-2001 and finally part of the mainland. Other islands like Kokaral and Barsa-Kelmes shared a similar fate. Since the disappearance of the Southeast Aral in 2008, Vozrozhdeniya effectively no longer exists as a distinct geographical feature. The area is now shared by Kazakhstan and Uzbekistan. In 1948, a top-secret Soviet bioweapons laboratory was established on the island, in the centre of the Aral Sea which is now disputed territory between Kazakhstan and Uzbekistan. The exact history, functions and current status of this facility are still unclear, but bio-agents tested there included Bacillus anthracis, Coxiella burnetii, Francisella tularensis, Brucella suis, Rickettsia prowazekii, Variola major (smallpox), Yersinia pestis, botulinum toxin, and Venezuelan equine encephalitis virus. In 1971, weaponized smallpox from the island reached a nearby ship, which then allowed the virus to spread to the city of Aral. Ten people there were infected, of whom three died, and a massive vaccination effort involving 50,000 inhabitants ensued (see Aral smallpox incident). The bioweapons base was abandoned in 1992 following the disintegration of the Soviet Union the previous year. Scientific expeditions proved this had been a site for production, testing and later dumping of pathogenic weapons. In 2002, through a project organized by the United States and with Uzbekistan's assistance, 10 anthrax burial sites were decontaminated. According to the Kazakh Scientific Center for Quarantine and Zoonotic Infections, all burial sites of anthrax were decontaminated. In June 2007, BBC World broadcast a documentary called Back From the Brink? made by Borna Alikhani and Guy Creasey, which showed some of the changes in the region since the introduction of the Aklak Dam. Bakhtyar Khudojnazarov's 2012 movie Waiting for the Sea deals with the impacts on people's life in a fishing town at the shore of the Aral Sea. In 2012 Christoph Pasour and Alfred Diebold produced an 85-minute film with the title "From the glaciers to the Aral Sea", which shows the water management system in the Aral Sea basin and in particular the situation around the Aral Sea. The film was first screened at the 6th World Water Forum in Marseille, France, in 2012 and is now available on the website: www.waterunites-ca.org and on Alfred Diebold's YouTube channel: waterunitesca. In 2014, director Po Powell shot much of the footage for the Pink Floyd single "Louder than Words" video near the remains of the Aral Sea on the border between Kazakhstan and Uzbekistan. Dry bottom of Aral Sea appears in 2017 film Guardians. ^ a b "DRAINAGE BASIN OF THE ARAL SEA AND OTHER TRANSBOUNDARY SURFACE WATERS IN CENTRAL ASIA" (PDF). United Nations Economic Commission for Europe (UNECE). 2005. Retrieved 4 Feb 2016. ^ a b c "The Kazakh Miracle: Recovery of the North Aral Sea". Environment News Service. 2008-08-01. Archived from the original on April 12, 2010. Retrieved 2010-03-22. ^ a b Philip Micklin; Nikolay V. Aladin (March 2008). "Reclaiming the Aral Sea". Scientific American. Retrieved May 17, 2008. ^ "Satellite image, August 16, 2009 (click on "2009" and later links)". ^ Liston, Enjoli (1 October 2014). "Satellite images show Aral Sea basin 'completely dried'". The Guardian. London: Guardian News and Media Limited. Retrieved 2014-10-01. ^ Stephen M Bland. "Central Asia Caucasus". stephenmbland.com. ^ "Aral Sea Reborn". Al Jazeera. July 21, 2012. Retrieved January 6, 2013. ^ Daily Telegraph (2010-04-05). "Aral Sea 'one of the planet's worst environmental disasters'". The Daily Telegraph. London. Archived from the original on April 8, 2010. Retrieved 2010-05-01. ^ "About travel to Aral Sea". Retrieved 2016-08-29. ^ "Syr Darya river, Central Asia". Encyclopedia Britannica. ^ a b Valikhanov, Chokan Chingisovich; Venyukov, Mikhail Ivanovich (1865). The Russians in Central Asia: their occupation of the Kirghiz steppe and the line of the Syr-Daria: their political relations with Khiva, Bokhara, and Kokan: also descriptions of Chinese Turkestan and Dzungaria. Translated by John Michell, Robert Michell. London: Edward Stanford. pp. 324–329. ^ Rich, David Alan (1998). The Tsar's colonels: professionalism, strategy, and subversion in late Imperial Russia. Harvard University Press. p. 247. ISBN 0-674-91111-3. ^ "Soviet cotton threatens a region's sea - and its children". New Scientist. November 18, 1989. Retrieved January 27, 2010. ^ USDA-Foreign Agriculture Service (2013). "Cotton Production Ranking". National Cotton Council of America. Retrieved Oct 14, 2013. ^ a b "Cotton production linked to images of the dried up Aral Sea basin". The Guardian. 1 October 2014. ^ "The True Costs of Cotton: Cotton Production and Water Insecurity" (PDF). Environmental Justice Foundation (EJF). ^ Uzbekistan in Numbers 2006, State Statistical Committee of the Republic of Uzbekistan, Tashkent, 2007 (in Russian). ^ "ca-water.net, a knowledge base for projects in the Central Asia". 2003. Retrieved 1 November 2010. ^ Micklin, Philip (December 2017). "The past, present, and future Aral Sea". Lakes & Reservoirs: Research & Management. 15 (3): 193–213. ^ a b Michael Wines (2002-12-09). "Grand Soviet Scheme for Sharing Water in Central Asia Is Foundering". The New York Times. Retrieved 2008-03-08. ^ Glantz, Michael H. (1999). Creeping Environmental Problems and Sustainable Development in the Aral Sea... Cambridge, New York: Cambridge University Press. p. 174. ISBN 0-521-62086-4. Retrieved May 17, 2008. ^ Philip P. Micklin (1988). "Desiccation of the Aral Sea". CIESIN, Columbia University. Retrieved January 6, 2013. ^ a b c d "The Aral Sea Crisis". Thompson, Columbia University. Retrieved January 6, 2013. ^ Keith, DA; Rodríguez, J.P.; Rodríguez-Clark, K.M. ; Aapala, K.; Alonso, A.; Asmussen, M.; Bachman, S.; Bassett, A.; Barrow, E.G. ; Benson, J.S. ; Bishop, M.J.; Bonifacio, R.; Brooks, T.M. ; Burgman, M.A. ; Comer, P.; Comín, F.A. ; Essl, F.; Faber-Langendoen, D.; Fairweather, P.G. ; Holdaway, R.J.; Jennings, M.; Kingsford, R.T.; Lester, R.E. ; Mac Nally, R.; McCarthy, M.A. ; Moat, J.; Nicholson, E.; Oliveira-Miranda, M.A. ; Pisanu, P.; Poulin, B.; Riecken, U.; Spalding, M.D. ; Zambrano-Martínez, S. (2013). "Scientific Foundations for an IUCN Red List of Ecosystems". PLoS One. 8 (5): e62111. doi:10.1371/journal.pone.0062111. PMC 3648534. PMID 23667454. Retrieved 8 September 2018. ^ Whish-Wilson, Phillip (2002). "The Aral Sea environmental health crisis" (PDF). Journal of Rural and Remote Environmental Health. 1 (2): 30. Archived (PDF) from the original on April 9, 2008. Retrieved May 17, 2008. ^ a b c Jensen, S.; Mozhitova, Z.; Zetterstrom, R. (5 November 1997). "Environmental pollution and child health in the Aral Sea region in Kazakhstan". Science of the Total Environment. 206 (2–3): 187–193. ^ O'Hara, Sarah; Wiggs, Giles; Mamedov, Batyr; Davidson, George; Hubbard, Richard (19 February 2000). "Exposure to airborne dust contaminated with pesticide in the Aral Sea region". The Lancet. 355 (9204): 627–628. ^ "Aral Sea - Aral Sea". Archived from the original on 2009-03-16. ^ Saiko, Tatyana (1998). "Geographical and socio-economic dimensions of the Aral Sea crisis and their impact on the potential for community action". Journal of Arid Environments. 39 (2): 230. Retrieved 18 September 2018. ^ a b McDermid, Sonali Shukla; Winter, Jonathan (December 2017). "Anthropogenic forcings on the climate of the Aral Sea: A regional modeling perspective". Anthropocene. 20: 48–60. ^ a b Chen, Dene-Hern (16 March 2018). "Once Written Off for Dead, the Aral Sea Is Now Full of Life". ^ Bland, Stephen M. (2015-01-27). "Kazakhstan: Measuring the Northern Aral's Comeback". EurasiaNet. Retrieved 2017-09-19. ^ "Uzbekistan: Moynaq village faces the Aral Sea disaster". UNICEF. ^ Ataniyazova, Oral (18 March 2003). "Health and Ecological Consequences of the Aral Sea Crisis" (PDF). ^ Crighton, Eric James; Barwin, Lynn; Small, Ian; Upshur, Ross (April 2011). "What have we learned? A review of the literature on children's health and the environment in the Aral Sea area". International Journal of Public Health. 56 (2): 125–138. ^ Kaneko, K; Chiba, M; Hashizume, M; Kunii, O; Sasaki, S; Shimoda, T; Yamashiro, Y; Caypil, W; Dauletbaev, D (4 March 2003). "Renal tubular dysfunction in children living in the Aral Sea Region". Archives of Disease in Childhood. 88 (11): 966–968. ^ Small, Ian; van der Meer, J; Upshur, Ross (1 June 2001). "Acting on an environmental health disaster: the case of the Aral Sea". Environmental Health Perspectives. 109 (6): 547–549. ^ a b c Small, Ian; van der Meer, J; Upshur, Ross (1 June 2001). "Acting on an environmental health disaster: the case of the Aral Sea". Environmental Health Perspectives. 109 (6): 547–549. ^ Peachey, Everett (2004). "The Aral Sea Basin Crisis and Sustainable Water Resource Management in Central Asia" (PDF). Journal of Public and International Affairs. 15: 1–20. ^ Usmanova, RM (2013-03-25). "Aral Sea and sustainable development". Water Sci Technol. 47 (7–8): 41–7. PMID 12793660. ^ Olli Varis. 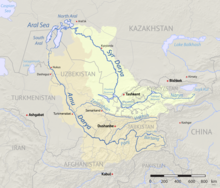 "Resources: Curb vast water use in central Asia. [Nature Vol 514(7520)]". ^ Ed Ring (2004-09-27). "Release the Rivers: Let the Volga & Ob Refill the Aral Sea". Ecoworld. Archived from the original on April 29, 2008. Retrieved May 17, 2008. ^ "Aral Sea Refill: Seawater Importation Macroproject". The Internet Encyclopedia of Science. June 29, 2008. Retrieved 2009-10-08. ^ "Water-related vision for the Aral Sea Basin for the year 2025; 2000" (PDF). Retrieved 2013-06-12. ^ "(Nederland) - UNESCO promotes unsustainable development in Central Asia". Indymedia NL. Retrieved July 18, 2009. ^ "A Witch's Brew". BBC News. July 2006. Archived from the original on December 13, 2007. Retrieved May 17, 2008. ^ Shawki Barghouti (2006). Case Study of the Aral Sea Water and Environmental Management Project: an independent evaluation of the World Bank's support of regional programmes. The World Bank (Report). Retrieved 1 November 2010. ^ Program of actions on providing assistance to the countries of the Aral Sea Basin for the period of 2011-2015 (ASBP-3) (PDF) (Report). International Fund for saving the Aral Sea. 2012. ^ a b Ilan Greenberg (2006-04-07). "A vanished Sea Reclaims its form in Central Asia". Int. Her. Trib. Archived from the original on 12 May 2008. Retrieved May 17, 2008. ^ Ilan Greenberg (2006-04-06). "As a Sea Rises, So Do Hopes for Fish, Jobs and Riches". The New York Times. Archived from the original on January 5, 2015. Retrieved 2008-05-16. ^ "Miraculous Catch in Kazakhstan's Northern Aral Sea". The World Bank. June 2006. Retrieved May 17, 2008. ^ "North Aral Sea Recovery". The Earth Observatory. NASA. 2007. Retrieved 2008-05-17. ^ a b Martin Fletcher (June 23, 2007). "The return of the sea". The Times. London. Retrieved May 17, 2008. ^ "Saving a Corner of the Aral Sea". The World Bank. 2005-09-01. Retrieved May 17, 2008. ^ "The rehabilitation of the ecosystem and bioproductivity of the Aral Sea under conditions of water scarcity" (PDF). August 2007. ^ "Strategies suggested for implementation". ICWC. Retrieved January 6, 2013. ^ "IFAS". WaterWiki.net. Retrieved April 4, 2010. 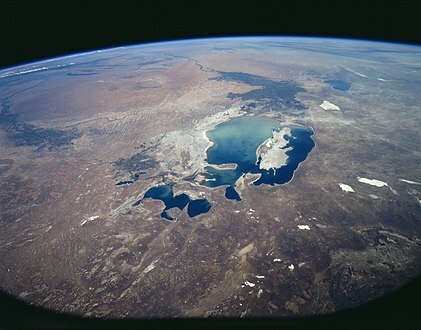 ^ "Uzbekistan, intl consortium ink deal on exploring Aral Sea". ITAR-Tass. Archived from the original on 2010-07-27. ^ Michael Hancock-Parmer (2010-06-09). "Aral Gas". Registan.net. Archived from the original on 2010-06-11. ^ "Psy". Kino Expert. Retrieved September 18, 2009. ^ "Delta Blues (in a land of cotton)". YouTube. November 5, 2008. Retrieved July 18, 2009. ^ "Videos - From the Glaciers to the Aral Sea - Water Unites". www.waterunites-ca.org. ^ "Water Unites - From the Glaciers to the Aral Sea". youtube. ^ Al Jazeera World. "People of the Lake". Retrieved 4 December 2015. ^ "Watch Pink Floyd's Surreal, Sun-Baked 'Louder Than Words' Video". Rolling Stone. Retrieved 4 December 2015. Micklin, Philip (2007). "The Aral Sea Disaster". Annual Review of Earth and Planetary Sciences. 35 (4): 47–72. doi:10.1146/annurev.earth.35.031306.140120. Retrieved May 17, 2008. Bissell, Tom (April 2002). "Eternal Winter: Lessons of the Aral Sea Disaster". Harper's. pp. 41–56. Retrieved May 17, 2008. Ellis, William S (February 1990). "A Soviet Sea Lies Dying". National Geographic. pp. 73–93. Bendhun, François; Renard, Philippe (2004). "Indirect estimation of groundwater inflows into the Aral sea via a coupled water and salt mass balance model". Journal of Marine Systems. 47 (1–4): 35–50. doi:10.1016/j.jmarsys.2003.12.007. Archived from the original on February 14, 2008. Retrieved May 17, 2008. Sirjacobs, Damien; Grégoire, Marilaure; Delhez, Eric; Nihoul, JCJ (2004). "Influence of the Aral Sea negative water balance on its seasonal circulation patterns: use of a 3D hydrodynamic model". Journal of Marine Systems. 47 (1–4): 51–66. doi:10.1016/j.jmarsys.2003.12.008. Wikivoyage has a travel guide for Aral Sea. Wikimedia Commons has media related to Aral Sea. "Syr Darya Control & Northern Aral Sea Phase I Project". World Bank Group - Kazakhstan. December 2006.